Peter Thomson (left), President of the seventy-first session of the General Assembly. At his side is Movses Abelian, Assistant Secretary-General for General Assembly and Conference Management. The General Assembly today approved the establishment of a new United Nations office to help Member States implement the Organization's global counter-terrorism strategy. Adopting a consensus resolution, the 193-nation body also welcomed Secretary-General António Guterres' initiative to transfer relevant functions out of the UN Department of Political Affairs (DPA) and into the new United Nations Office of Counter-Terrorism. As a result, the Counter-Terrorism Implementation Task Force Office (CTITF) and the UN Counter-Terrorism Centre (UNCCT), currently in DPA, will be transferred to the new office, together with their existing staff and all associated regular and extra-budgetary resources. The new Office would he headed up by an Under-Secretary-General. 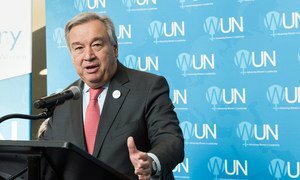 In his report on this issue to the Assembly, the Secretary-General proposed that the new Under-Secretary-General would Chair the Task Force and Executive Director of the UN Counter-Terrorism Centre. “The Secretary-General considers counter-terrorism and prevention of violent extremism to be one of the highest priorities of the United Nations to address a growing threat to international peace and security,” said his Spokesman Stéphane Dujarric in a statement issued just after the Assembly's action. “He therefore hopes that this reform of the UN Counter-Terrorism architecture will contribute to the UN's broader efforts to promote conflict prevention, sustainable peace and development,” the Spokesman said.